Related video report by Richard Green. Migrants hoping to travel westward have flooded into the main train station in Budapest after it was reopened by police, but Hungarian officials say there will be no trains heading to western Europe. Police left the Keleti train station on Thursday, after a two-day standoff with hundreds of migrants hoping to board trains to Germany, where they plan to apply for asylum. But while the migrants have been allowed into the station, it is not clear where they will go, without the option of traveling west. 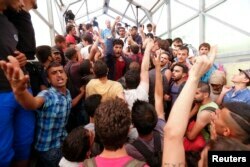 Hungarian authorities allowed people to travel westward from Keleti station without EU travel visas on Monday, shortly after Germany announced it will accept asylum applications; but on Tuesday, Hungarian officials abruptly began refusing passage to people without visas. Migrants gather at the railway station in the town of Bicske, Hungary, Sept. 3, 2015. Hungarian Prime Minister Viktor Orban said Thursday the migrant issue at the Hungarian border is not a European problem, but a German one. Orban spoke in Brussels after a meeting with European Parliament President Martin Schulz. He said the refugees must all cross through his country and others to get to Germany. He said Hungary has done "everything possible" to follow European regulations, including registering them before allowing them to head west. But European Parliament President Schulz disagreed, saying the problem is not one for Germany only, but for all of Europe. He said distributing the 500,000 refugees among Europe's population of 507 million "is not a problem," but concentrating them among only a few member states would be. He said European solidarity is key to resolving the issue. The European Union has been struggling to grapple with its worst refugee situation since World War II. Hundreds of thousands of people have arrived on European borders in the past year, fleeing conflict and poverty in Syria and other parts of the Middle East, Asia and Africa. The 28-member EU plans to hold emergency talks on the issue on September 14. A paramilitary police officer carries the lifeless body of an unidentified migrant child, lifting it from the seashore near the Turkish resort of Bodrum, Sept. 2, 2015. Meanwhile, French Prime Minister Manuel Valls has released a message about a young Syrian boy found dead on a Turkish beach, whose photo was printed Wednesday in newspapers across Europe, making the tiny victim the poster child for the continent's refugee crisis. "He had a name," Valls said on social media. "Aylah Kurdi. Urgent to act. Urgent to have a European mobilization." The countries most affected by the migrant crisis —Greece, Italy and Hungary — have asked for more help. Germany, which is expecting to receive about 800,000 asylum seekers this year, has called on EU partners to share more of the burden by accepting larger numbers of migrants. Asylum applications in select EU countries, Jan, 2015 - June, 2015. The foreign ministers of Italy, France and Germany signed a joint document Wednesday calling for a "strong response to the crisis" and for a review of current EU rules on granting asylum and a "fair" distribution of migrants within the EU. The document says the migrant crisis has "clearly shown the limits and defects" of the rules on asylum and that they need to be re-assessed. A spokesman for the United Nations refugee agency, Babar Baloch, told VOA, "All the countries have their own responsibility to deal with this crisis." The emergencies director for New York-based Human Rights Watch, Peter Bouckaert, condemned what he calls the "indifference and obstacles" by European leaders for migrants trying to escape war and poverty.